Fisheries are in a state of crisis throughout the world. While there has been some success, truly effective fisheries management seems beyond our grasp. The knowledge needed for proper management contains a broad array of facts and connections from statistical stock assessments, to the information that allows government agencies to track compliance with rules and beyond. This book describes the state-of-the-art knowledge about fishery systems. Seldom seen in a scientific publication regarding fisheries science, this book presents a multidisciplinary perspective of fisheries management. Leading fisheries scholars with backgrounds in biology, ecology, economics and sociology ask how management institutions can learn and put their lessons to use. 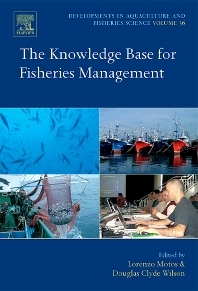 The Knowledge Base for Fisheries Management offers a unique overview of the world of fisheries management and provides the background to draw conclusions of what is needed to improve management. Covering a wide range of regimes, case studies and professional perspectives, this publication will be an obliged reference to anyone involved on fisheries management, assessment, policy making or fisheries development all over the world.